Bedbugs are back, and they're worse than ever. While pesticides kept them under control for most of the twentieth century, the bloodsucking fiends have had a notable resurgence over the last decade. And, between expensive lawsuits and pricey eradication techniques, the bugs are hitting renters, homeowners and companies where they're most vulnerable -- in their wallets. In July 2010, the most publicized bedbug victims were all retailers: Hollister, Abercrombie and Fitch (ANF), and Victoria's Secret (LTD) all had to close stores in New York City when the tiny bloodsuckers moved in. The case of Hollister, the first to shut its doors, is particularly illustrative: According to some employees, the company knew about the bugs for weeks but chose to stay open, afraid of a loss of income and the stigma associated with admitting an infestation. Given the ability of bedbugs to easily hitchhike on customers' clothes, this decision could cost the retailer dearly in lawsuits. It isn't hard to figure out why Hollister may have ignored its growing bedbug problem: Any insect infestation can stigmatize a company, but bedbugs are especially damaging. Dr. Susan Jones, an associate professor of entomology at Ohio State University, explains why: "Ticks and mosquitoes bite us when we're outside, in their world, but bedbugs invade the safety and sanctity of our homes. We see our homes as a sanctum. Bedbugs hide in our spaces and come out at night to feed on us." And, unlike other parasites, bedbugs deliberately target humans. As Jones notes, "They are an insect that only consumes blood and prefers human blood." For most people, bedbugs are not life-threatening -- at least, not physically. Between 50% and 70% of people are allergic to the bites, and will develop itchy welts, similar to mosquito bites. In a few cases, the bugs have been linked to asthma attacks, and persistent assaults from the vampiric visitors can potentially lead to anemia. But, unlike mosquitoes, ticks, fleas, or other pests, bedbugs do not seem to carry any blood-borne diseases. But while the physical effects of bedbugs are negligible, their emotional and psychological impact can be devastating. Dr. Jones notes that "bedbug victims can lose lots of sleep and can become very anxious, or even panic-stricken." Some develop delusional parasitosis, a mental disorder in which sufferers become convinced that they are being bitten by bugs, even when they are not. Jones stresses that this condition can have brutal physical and emotional effects. The EPA has declared bedbugs a public health pest and, in April 2009, it held a national bedbug summit to solicit recommendations for dealing with the growing menace. In it, the group highlighted the emotional and psychological effects of bedbugs, arguing that the definition of public health needed to be enlarged to include "overall wellness [and] mental health." It also addressed the dangers of bedbug-inspired insomnia, noting that loss of sleep could be disastrous for "pilots, flight attendants, and other professionals." This mental health component goes a long way toward explaining why bedbug infestations can be so expensive. The costs of July's Hollister, Abercrombie and Victoria's Secret infestations have yet to be tallied, but previous bedbug-related legal cases have led to massive payouts. In 2003, Burl and Desiree Mathias successfully sued the Motel 6 chain for physical and emotional damages resulting from bedbug bites: A jury awarded them $382,000. 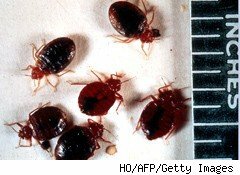 The following year, Leona Helmsley's Park Lane hotel paid a $150,000 settlement to two customers who claimed that bedbugs at the hotel had attacked them, then infested their home. And in 2007, the ultimate bedbug lawsuit came from opera singer Alison Trainer, who claimed that an attack in the Phoenix Hilton Suites had left her unable to sleep in a bed and had caused her to lose weight. She asked for $6 million. Companies have been dealing with bedbug complaints for decades. One of the most famous bedbug stories dates back to 1889 and concerns an attack on a train. Allegedly, Phineas P. Jenkins, a pig-iron salesman, was savaged by bedbugs while riding on a Pullman sleeper car. Enraged, he sent a letter to George Pullman, head of the company. Pullman responded with a heartfelt letter, promising to tear out the car's furnishings, burn its bedding, and do everything possible to eradicate the bedbugs. Satisfied, Jenkins was putting the letter away when he noticed a card tucked in the bottom of the envelope; across it, Pullman had written a message to his secretary: "Sarah: Send this S.O.B. the bedbug letter." Whether or not the Pullman story is true, it reveals the extreme measures that companies need to employ in order to eliminate bedbugs. To properly address an infestation, a hotel must call in an exterminator to apply extreme heat or pesticides to the room, as well as to adjacent rooms. The exterminator has to unscrew electric plug covers, spray behind baseboards, remove artwork, and generally turn the room upside down. The bedding and towels must be bagged and removed, while the mattress and box spring have to be thrown away. Carpeting and furniture might need to be disposed of as well and, in most cases, the exterminator will have to return at least once to repeat the entire process. The cost of treating a single hotel room is estimated at $6,000 to $7,000. The problem is even worse if a customer alerted the hotel to the problem: Given the danger of a bedbug stigma, hotels often go to extremes to ensure that customers are pleased with their attentiveness. According to an article in Bloomberg BusinessWeek, one Las Vegas hotel's standard procedure for bedbug complaints is to move customers to new rooms, dry clean all their clothes, and replace their luggage with new, uninfested bags. Clearly, the days of the "bedbug letter" have long since passed. For many companies in search of easy money, the bedbug terror has been a godsend, and the market is crawling with snake-oil salesmen. According to Dr. Jones, many "natural products" like cedar or lavender-based pesticides do little for a full-blown infestation, and can be like "putting a band-aid on a gaping wound." She notes that many of these formulations are exempt from registration, and don't have to provide efficacy data, which means that their producers' claims may be entirely fictitious. Some products, like bug bombs or foggers, can even make the problem worse. Unlike many insects that quickly infest a space, bedbugs tend to cluster in small areas. But, when an area is bug bombed, bedbugs will scatter, expanding their infestation throughout a home, apartment, or building. In spite of this, some companies, such as Hot Shot, advertise foggers for use with bedbugs. Jones notes that other options may help with bedbugs, but can take an extremely long time to work. Diatomaceous earth, for example, causes bedbugs to slowly asphyxiate, but can take weeks to be effective. As for alcohol-based sprays -- another common solution -- she notes that "they will kill bedbugs if they contact them. For that matter, so will a flyswatter or a rolled-up newspaper. The big problem isn't the bugs you can spray or swat; it's the ones in tiny cracks and crevices, the ones you cannot find." This isn't to say that all over-the-counter options are scams. Mattress and box-spring encasements, which cost between $75 and $180, trap bedbugs inside tightly-woven fabric, eliminating the need for new bedding. Mike Simpson, director of marketing for industry leader Protect-a-Bed, cites a University of Kentucky study found that 65% of bedbugs live in or around the bed, and that an effective encasement can save expensive mattresses and box-springs. Many people attribute the bedbug resurgence to the 1972 banning of DDT, but the truth is a bit more complicated. Dr. Jones asserts that the bugs quickly become resistant to pesticides, and that, for much of the last seventy years, the bugs' evolving resistance raced against the development of new poisons. For decades, humans held the upper hand, as the regular arrival of new pesticides consistently kept the menace under control. However, the EPA's decision to ban entire classes of chemicals opened a door for a bedbug resurgence. The current pesticides of choice, pyrethroids, are growing increasingly ineffective as bedbugs become resistant to them. Although the next chemical weapon, chlorphenapyr, seems to be effective, it's only a matter of time before it, too, will need to be replaced. Recently, bedbug professionals in Ohio asked the EPA to make an emergency exemption, allowing them to use Propoxur, a banned pesticide, to combat a growing menace in the state. The request was denied. Bedbugs are hardly a new phenomenon: Aristophanes, an ancient Greek writer, mentioned them in one of his plays, and Roman writer Pliny the Elder ruminated about their potential health benefits. In fact, except for a brief period in the twentieth century, they have been a recurring, irritating part of daily life for most of human history. While expensive exterminators and dangerous chemicals may provide an occasional reprieve from the scourge, it appears that they may be back to stay.